Babies sleep in cribs, not cats. So I thought. Then we had Blaise and he slept with us and cats do sleep in cribs. The first week Blaise was home, we ended up camping out downstairs in the family room. I’m not really sure why or how we decided this was a good idea, but it worked out really well. Maybe because the couch was so comfortable, the dogs could easily be taken out, the kitchen was right there, or because there was a TV to occupy us while he slept. Blaise was never put down; he either slept on Brian or me, depending on who was on Blaise duty. I missed our bed and sense of normalcy so we moved back up to our room after a week. But we had Blaise now, so what were we supposed to do with him? When I was pregnant with Blaise, I thought babies came home from the hospital and slept in their cribs. Brian wanted to co-sleep, specifically bed share. So we did, and I love that we did (and still do some nights). Blaise came a sleeper. Rather, he came an eater which in turn made him a sleeper. Either way, we lucked out never having that extreme tired feeling with Blaise (Laine was kind enough to share that with us). Twenty minutes after he was born he downed four ounces and was up to eight to ten ounces at two months. The kid ate. And ate. Since he ate so much he slept for long periods of time, because that’s what babies do, they sleep … all the time. He would wake a few times the first month, then was down to once at 5am until the Sunday after Thanksgiving when he was two and a half months. He woke up ready to eat at 5am as usual, and I really didn’t want to get up so I just pulled him closer and snuggled, and he went back to sleep until 9am. From that night on, he slept through the night and so did we. And we all slept in our bed. Laine was due in July so we knew we needed vacancy in our bed for her arrival. Blaise had been crawling a few months and was extremely mobile, and fearless about crawling off the bed (he laughed the second time he fell). We figured it was time for the crib. We hesitated starting the transition because, well, we liked having the little guy around all the time. But it was time. We started with naps for two weeks, and once he was cool with his crib and room, we started nights. It took a few nights of him protesting and us hanging out with him until he embraced sleeping alone. And he fully embrace it; he ultimately would crawl to his crib and want in, then lay down and go to sleep. It was so weird, we had our bed to ourselves and could stay downstairs past 7pm (Blaise’s bedtime) instead of going to bed with him. Cue Laine’s entrance. Laine didn’t come a sleeper or an eater, which was so out of our preferred comfort zone. She would eat an ounce or two, sleep a little, and repeat an hour or so later. We were tired. Really, really tired. Blaise wasn’t, he kept on sleeping. Laine would tease us; she’d go a week of sleeping well or even all night long, and we’d think we were golden, then the next week she’d be back to waking all.night.long. A little shout out to Brian for being the best dad and husband ever … he did 90% of the night feedings. I need sleep, more sleep than him, and he wanted to see Laine more since he worked during the day. We both scored. Laine eventually ate more and slept longer, and *finally* started sleeping through the night around six months. Blaise slept in his crib, Laine continued to sleep with us. Most importantly, we all slept. I would try to get Blaise to sleep with us now and then and he wanted nothing to do with any sleeping place outside of his crib; he wouldn’t even sleep in his car seat anymore. Blaise transitioned into a big boy bed in January when he was 15 months, and the plan was to eventually move Laine into the crib. We weren’t in any hurry to move Laine since we loved having her in bed with us. Just like with her brother, once she became super mobile, we decided it was time. Two kids, one room. Fail. We had a few nights and daytime nap successes but it didn’t work out. Laine was seven months and mobile, and needed to be confined; Blaise wanted to keep on sleeping. We set up the Pack ‘N Play next to our bed for Laine to sleep in. We started putting her down on her own, she protested. She would sleep just fine if we were all in bed together but the moment she was alone, she screamed. So we’d hang with her until she was out. Blaise kept on sleeping … he’d even put himself to bed if we were running late or he was tired before bedtime. Sometime in May, Laine’s light bulb went off and she just wanted to go to sleep on her own without us in the room. We’d hold her like we’d do knowing she’d scream if we put her down and she’d arch her back wanting to be put down. Now, she’ll walk over the the Pack ‘N Play and try to climb in when she’s ready for bed. 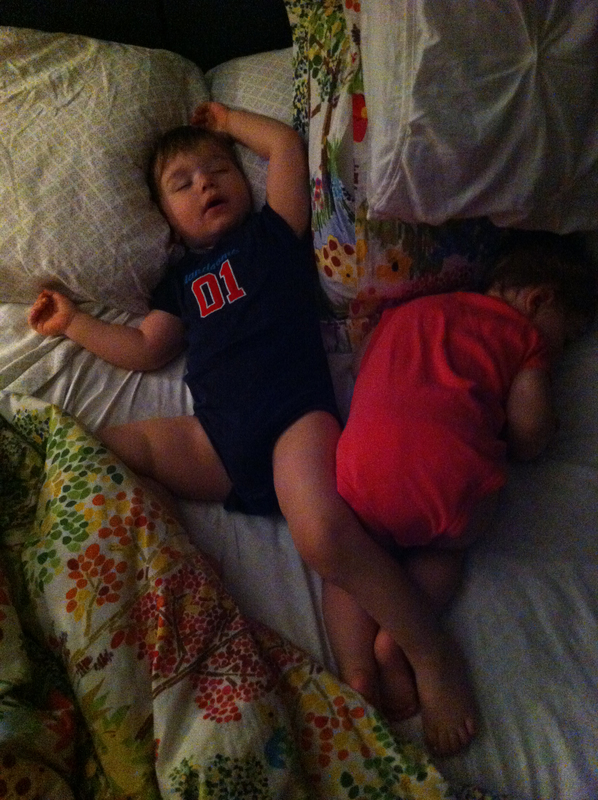 We had two awesome sleeping kiddos. Life was great. It was weird again. We were downstairs, kid-free, and didn’t really remember what we used to do with our evenings. Then came mid-June. Mid-June: our perfect sleeper was no longer perfect. Bedtime became a fight and being as strong-willed as he is, he was in it to win it. He’s been a climber since he could walk but never once climbed out of his crib before we moved him to the big boy bed, and had yet to climb the baby gate we had on his door during the night. That changed. During his protest of going to sleep, he’d hop the gate and run down the hall. It was a constant tug-of-war between us and him; he’d climb the gate, we’d put him back in his room. Repeat. For an hour. We ended up closing his door at night. I really didn’t like the idea but it seemed the logical choice; he wouldn’t sleep anywhere else and he’d climb the gate, and we wanted him safe. It helped. He’d still take an hour or so to get down, crying off and on, and one of us hanging out with him but he eventually went down and the closed door seemed to be the solution. Until early July. Early July: he was now easier to get down at bedtime, but then he started waking in the night. Blaise *never* woke in the night. He never had teething issues or regression, nothing. He slept, soundly. This was new for us; we had no idea why he was waking or what to do. Some nights one of us would sleep with him in his bed; some nights we’d stay with him until he went back to sleep; some nights he’d just cry no matter what we did. Then one night before we were leaving for vacation to celebrate Laine’s birthday, he woke up crying and we pulled him into our bed. Knowing this never worked in the past, we were prepared for a long night ahead of us. He fell asleep right away. So this became our solution. We had vacancy in our bed and a kiddo who woke up crying, and now he’d sleep with us so it worked. We didn’t care where he slept as long as he slept (and we love co-sleeping with our kiddos). And we knew in California our sleeping arrangements included him sharing a bed with us so it was also vacation training. Late July: after California, he was no longer easier to put down at bedtime. He became really, really mad and protested being alone in his room. Since he was sleeping with us on vacation, we started letting him fall asleep in our bed with us or on the couch, then we’d all go to bed together. Back to officially co-sleeping, and loving it (at first). 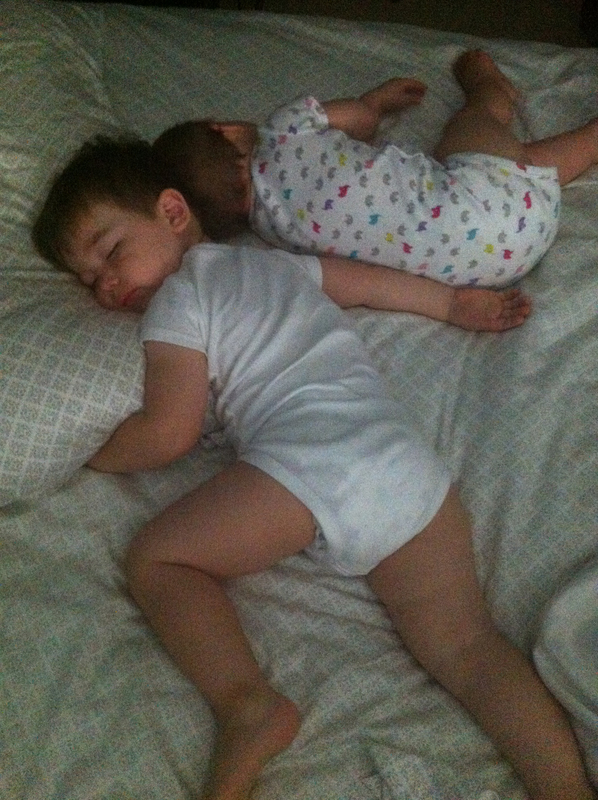 Mid-August: our bedtime to morning co-sleep love faded. Blaise became comfortable with falling asleep with us and started pushing the boundaries. It was like he was at a Catholic wedding, up, down, up, down … testing us. He needed to be back in his room at bedtime. We went through trial and error and eventually concluded he was now afraid of the dark. I turned to Google (err, Bing) and found the ever-popular Twilight Turtle (we’ve named Edward). Today: it’s been a week and we’re back to having two sleeping kiddos and evenings alone. Blaise is sleeping with his door open, snuggling Edward. Some nights he’s sleeping on the floor, some nights in his big boy bed, and some nights in the crib (which has been converted to a toddler bed with one side off). Laine is sleeping in the Pack ‘N Play in our room. We’re sleeping in our bed. There’s vacancy, it feels wrong. But knowing Blaise will sleep with us now, I steal him some nights when we go to bed, and some nights Laine joins us. Those are the nights it feels right. Future: who knows?! As long as we all sleep, it doesn’t matter where. Blaise won’t be 13 sleeping with his parents, and Laine will eventually move out of our room. I envision bunk beds in their future, but I also envision them having separate beds but sleeping together. The only constant is Mayah the wiener dog. She has and always will sleep with us, sideways. And thanks to her, we upgraded to a king bed a few years before kids which accommodates everyone on the nights we’re all together.